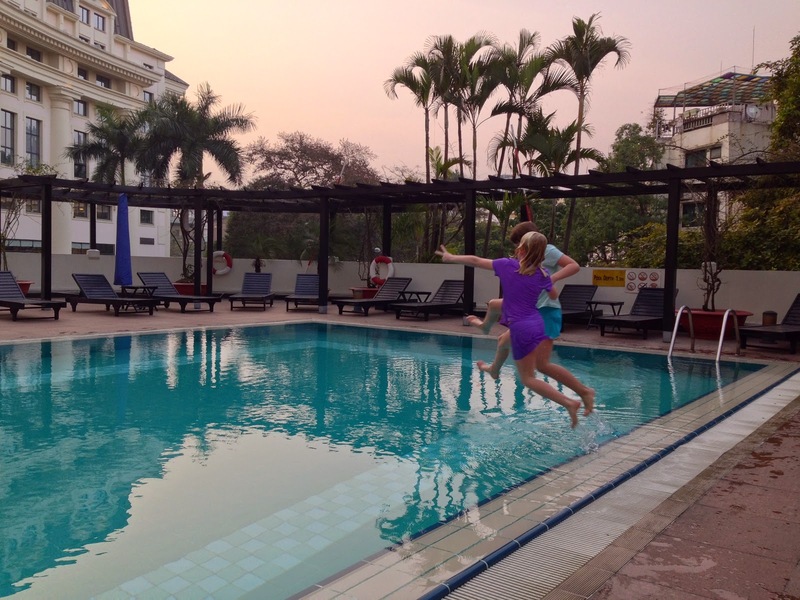 We spent the last two days of our Vietnam trip in Hanoi. 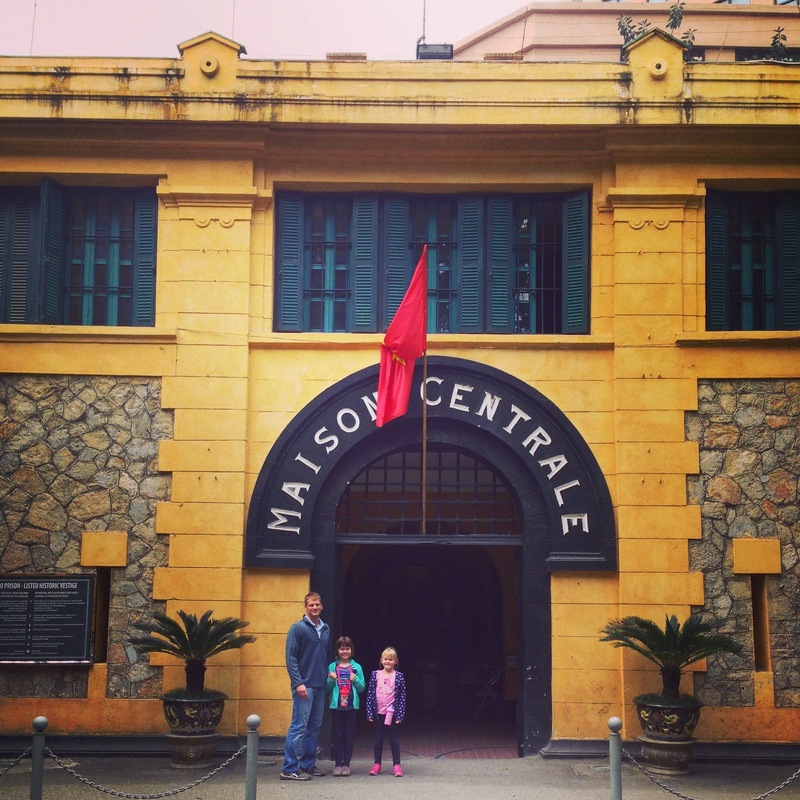 After checking into our hotel, (this was a seven-different-hotels-in-nine-nights kind of a trip), we set off on foot to find the notorious Hoa Lo Prison, otherwise known as the “Hanoi Hilton”. I loved the beautiful, and very colorful decorations for the upcoming holiday. 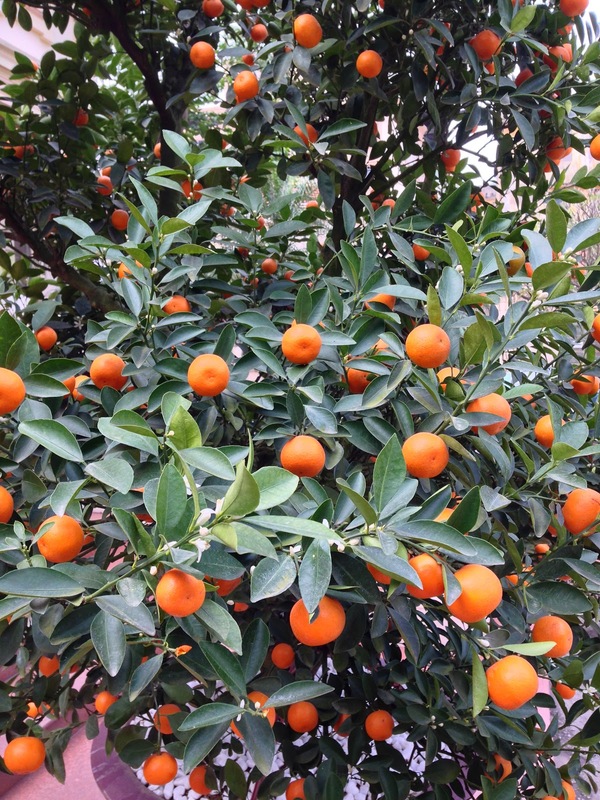 We learned that it was customary to decorate your home with a kumquat tree, or other flowering branch, for the lunar new year. We saw these trees everywhere, including being transported on the back of motorbikes! This is the main entrance to the prison. 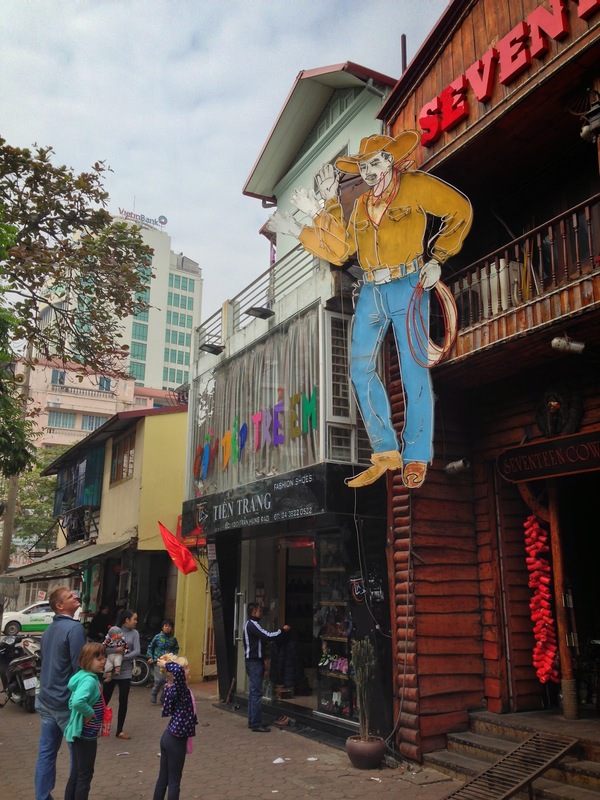 It was built in 1896 by the French and initially used to imprison Vietnamese revolutionaries, and later American soldiers. Most of the original complex was destroyed, and the remaining buildings were turned into the museum. 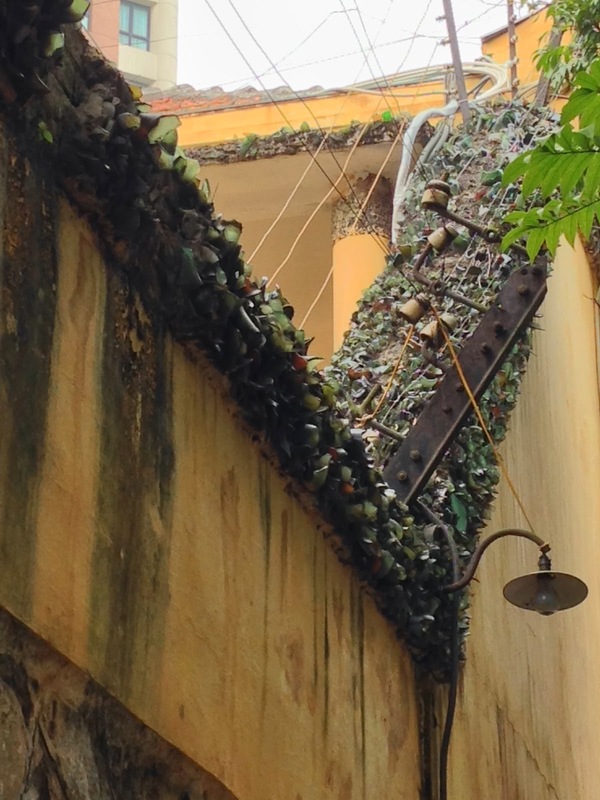 The top of the prison walls were covered in thick shards of glass. 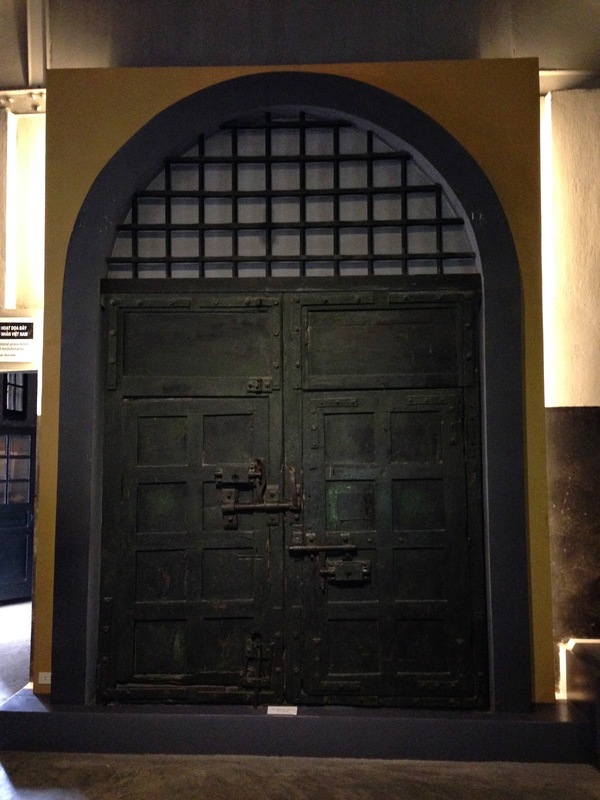 These are the huge doors into one of the chambers. 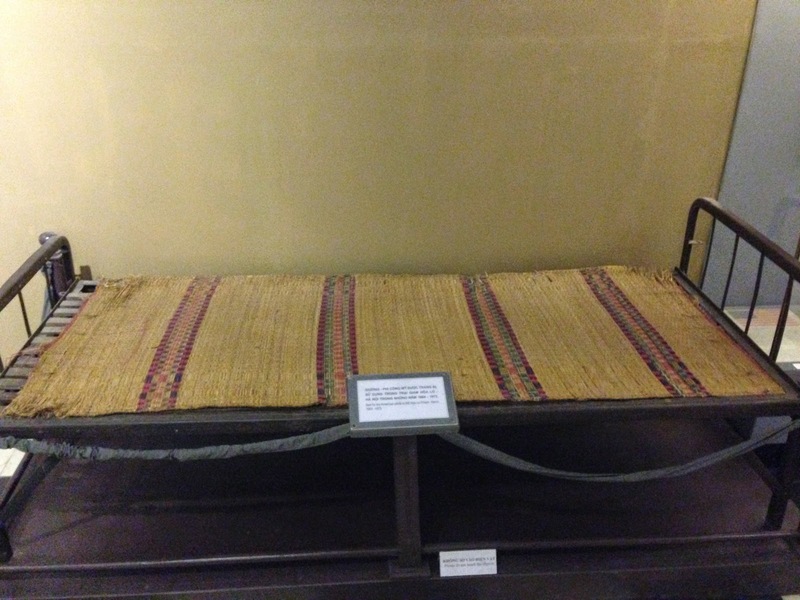 The materials used at the time, were of the highest French standards. 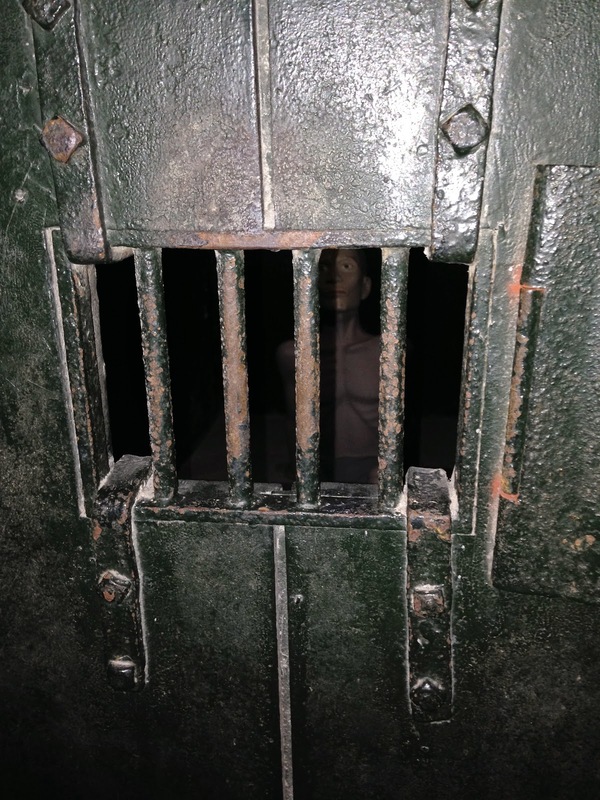 It was a little odd to see fancy doorknobs, intricate woodwork, and beautiful black and white French tile floors in some of the rooms of a prison. 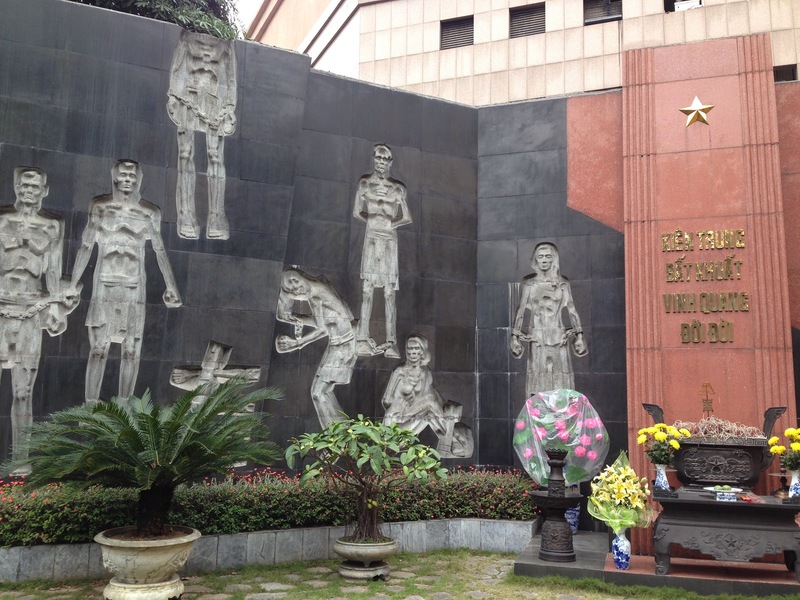 The majority of the museum depicted the suffering on the part of the Vietnamese, during the French occupation. 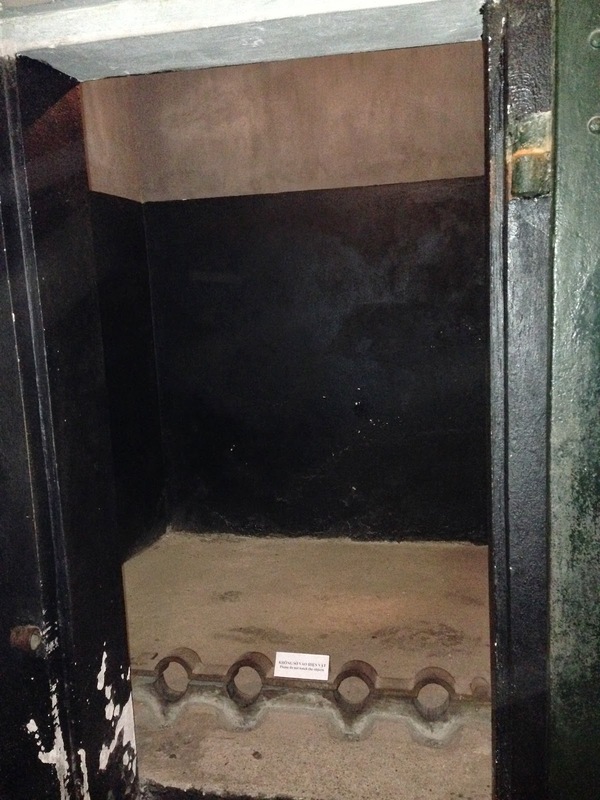 The prisoners were shackled in a large room like this, or held in the same manner in a private cell. It was sobering to think about the suffering that had occurred behind these walls. 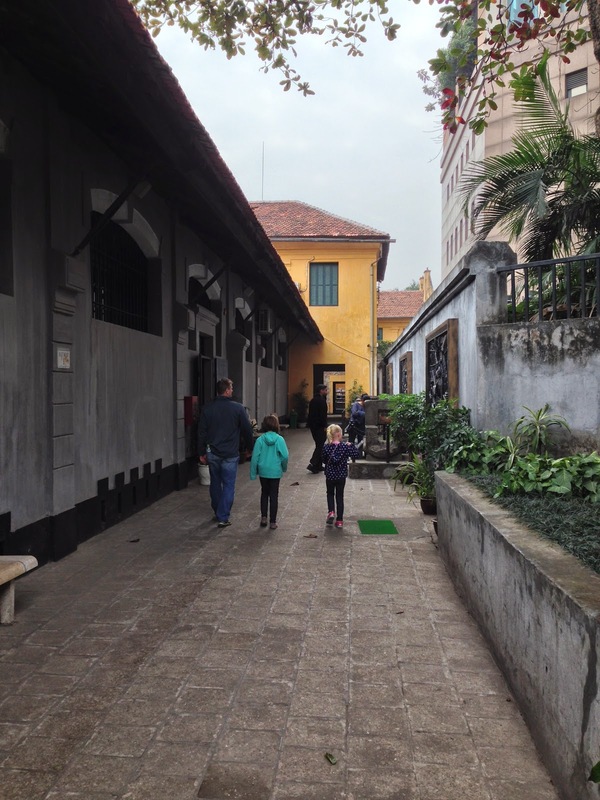 The beautiful courtyards surrounding the prison were such a strange juxtaposition. This was some sort of shrine to remember the fallen. 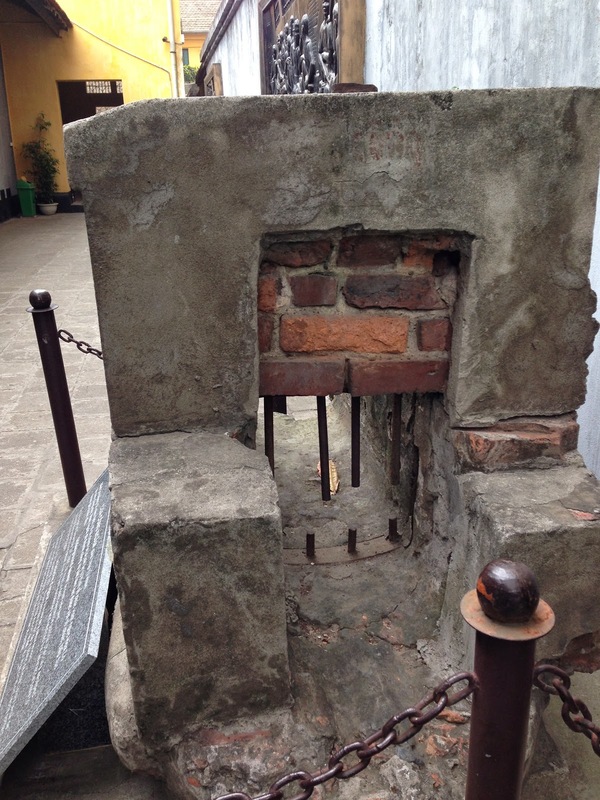 Some Vietnamese prisoners escaped through this sewer grate, at one time. By looking at it, I’m not even sure how! There were rows upon rows of small cells. 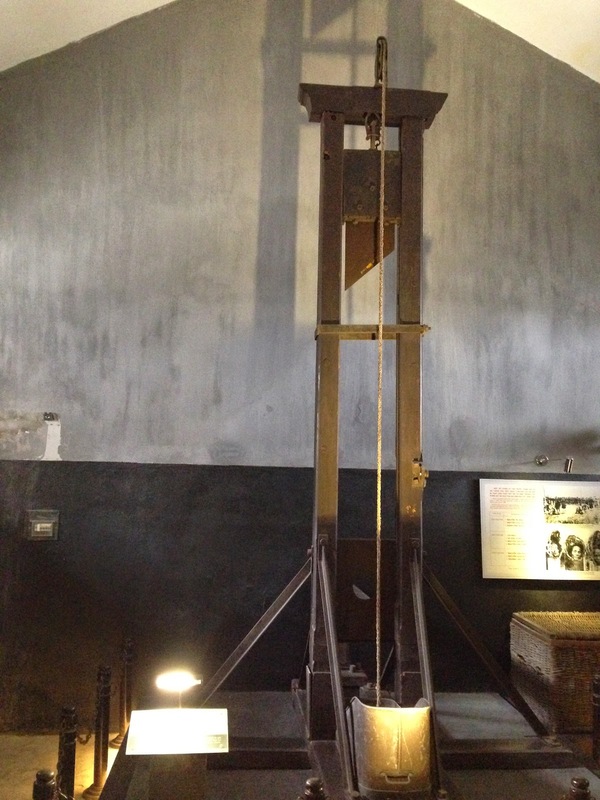 And the infamous French guillotine. And for the best part of all, in the next room were a series of many photographs showing American soldiers engaged in all sorts of joyful activities, including; enjoying a Christmas dinner, games of all kinds, sending and receiving mail from home, etc. Quite a different story from those told by US POW’s about the torture that occurred daily at the hands of the Vietnamese. (McCain also noted in an interview, that he refused to take part in these types of propaganda pictures.) 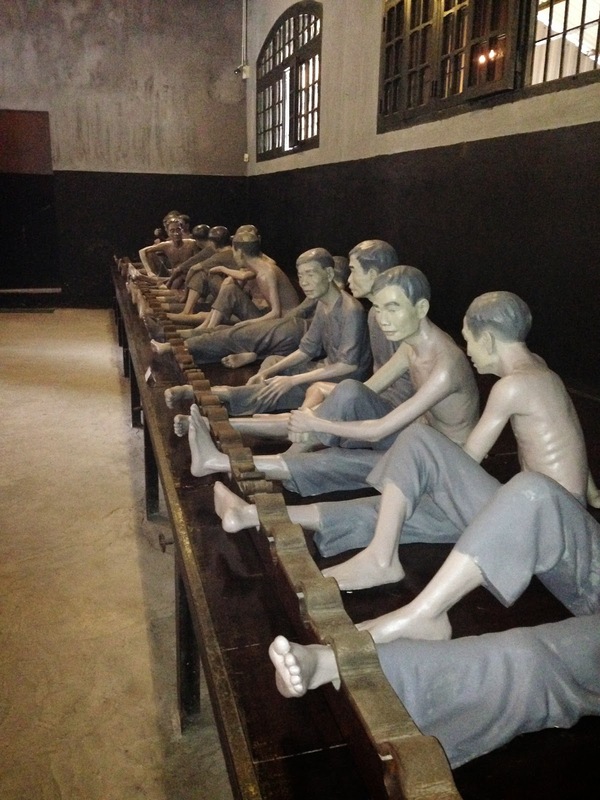 I also had to chuckle that the Vietnamese proudly claim the nickname “Hanoi Hilton” as proof that the accommodations were very nice. Apparently, sarcasm is lost in translation! Propaganda. This was a word my girls had not heard before and Ella, especially, was fascinated with the concept. She asked questions for the remainder of the day about life in the prison and wanted to know what really happened. At the hotel that night, we googled different POW accounts of the prison and she voraciously read everything I could find. We told her the takeaway message should be, don’t take anything you hear or read at face value, no matter the source. Always do your own investigation. 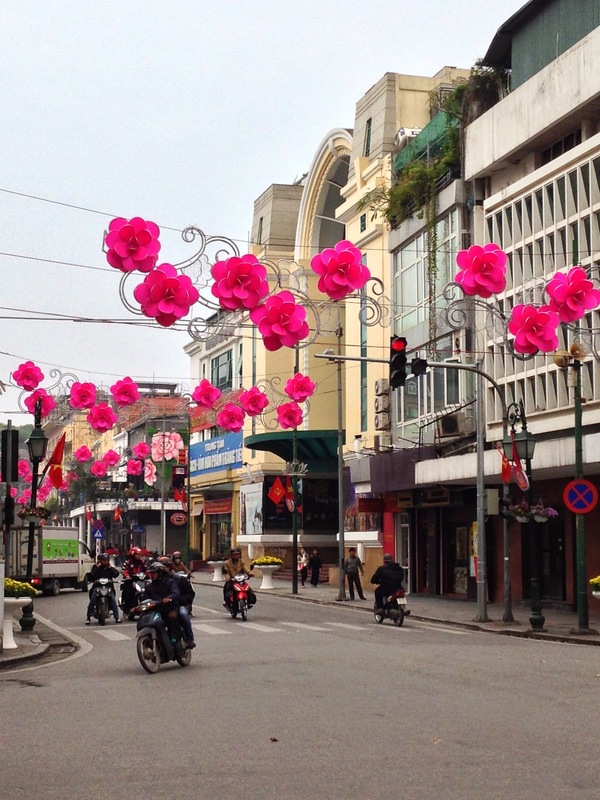 After the prison, we continued to explore Hanoi. This cowboy seemed so Las Vegas, circa 1960, that I had to take a picture! 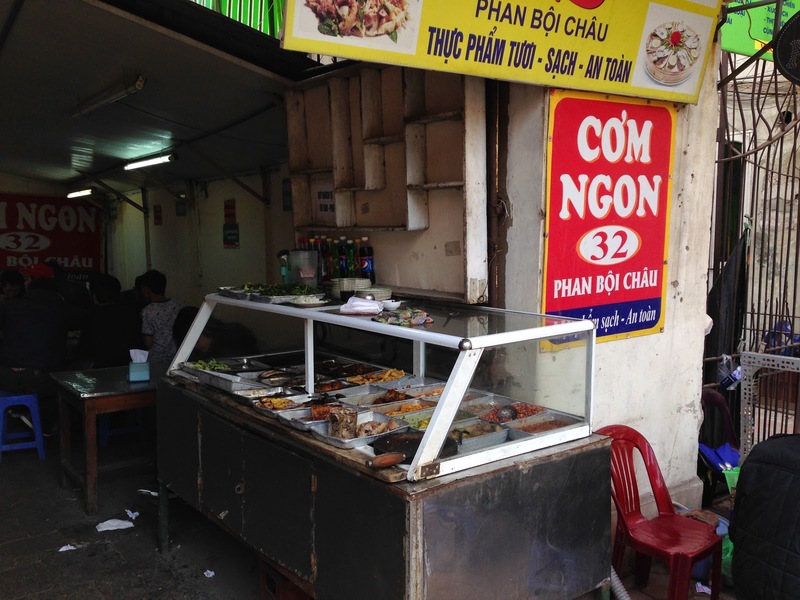 Little cafes such as this, were ubiquitous in Vietnam. Street food was definitely alive and well! 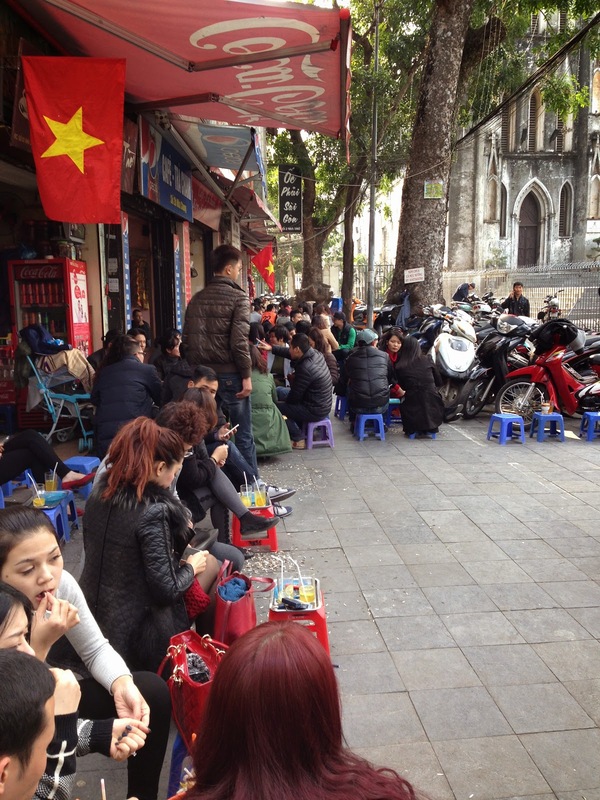 Also, all over the streets, people were hanging out eating, and visiting on these tiny little plastic stools. They even had them in some restaurants. More French architecture. 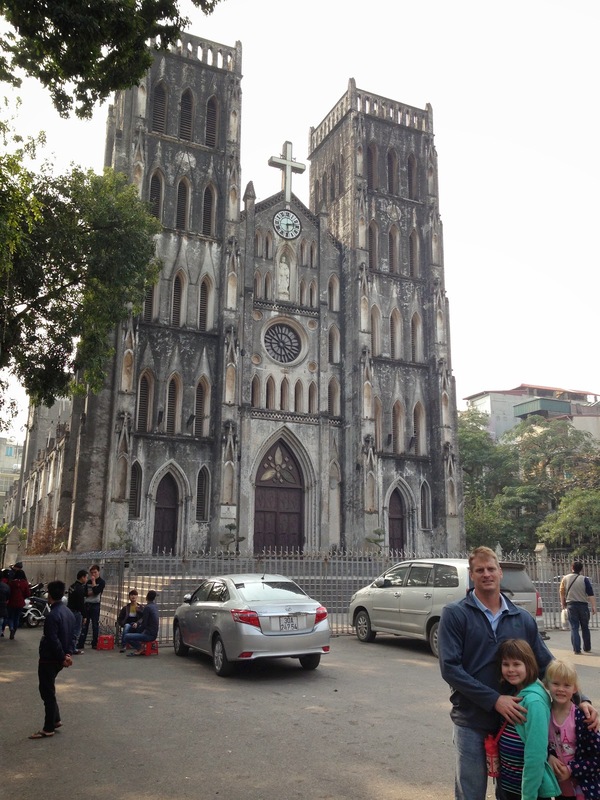 This was St. Joseph’s Cathedral, which is the oldest church in Hanoi, and modeled after the gothic style of Notre Dame in Paris. 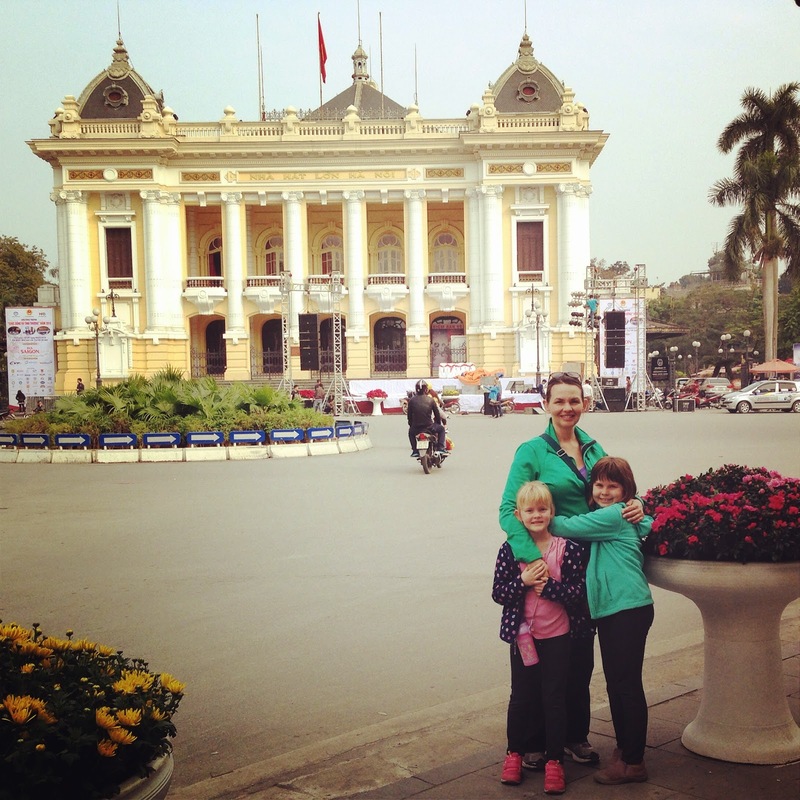 And the famous Hanoi Opera House, modeled after the Opera Garnier de Paris. There was a lovely city park in the center of the city, and we enjoyed strolling along the lake, on a beautiful Sunday afternoon. 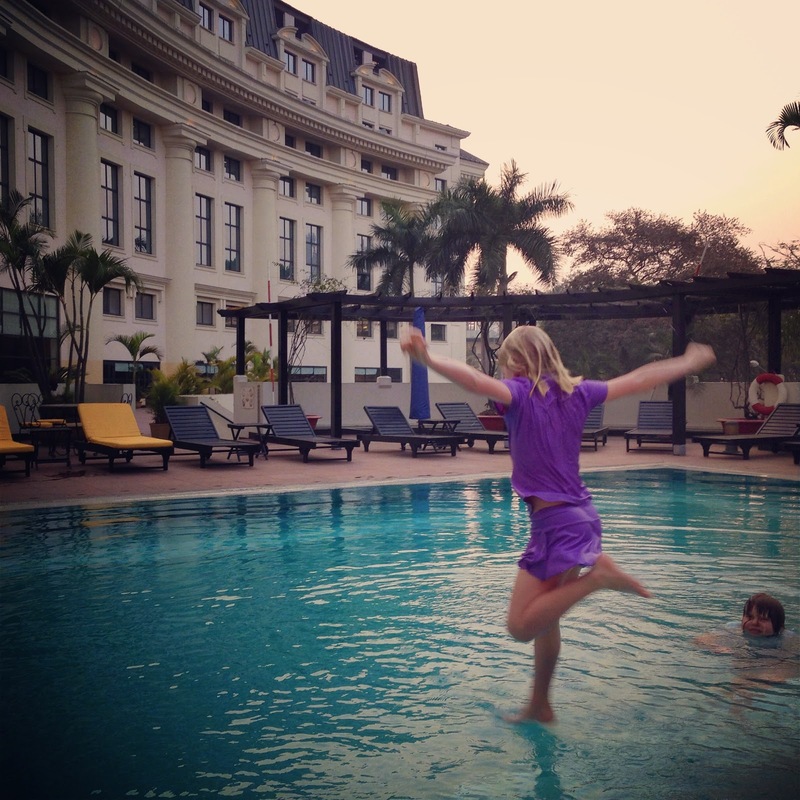 But at the end of the day, no matter where we travel, this is always the most requested activity. 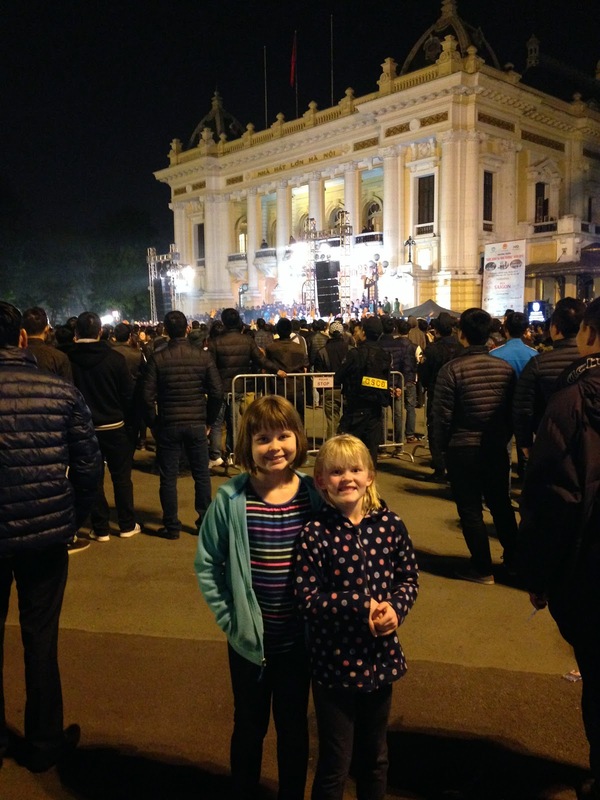 Later that evening, we were getting ready for bed, and we heard a live band playing outside- again! We decided to go down and check it out. 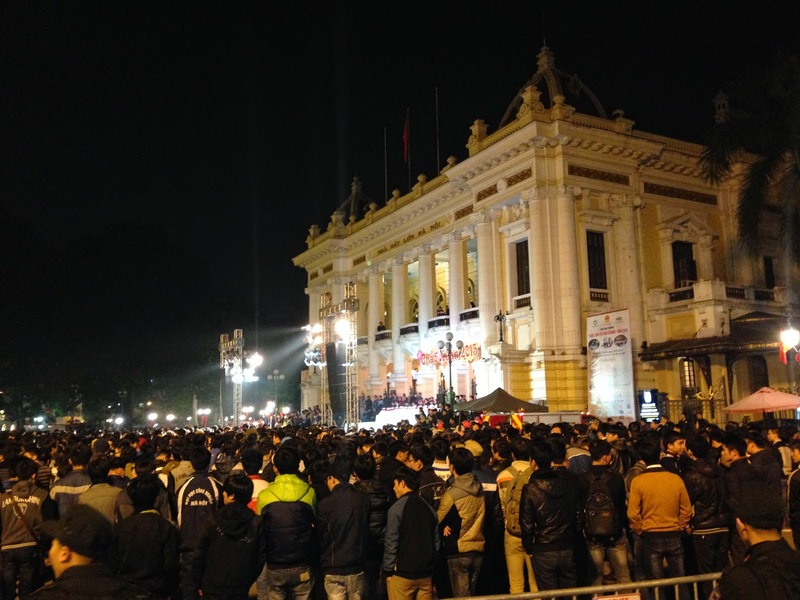 It seemed to be some sort of holiday celebration happening on the steps of the opera house. Suddenly, from out of nowhere, there was a large fire in the crowd, but people were not running or acting alarmed in any way. I was confused. 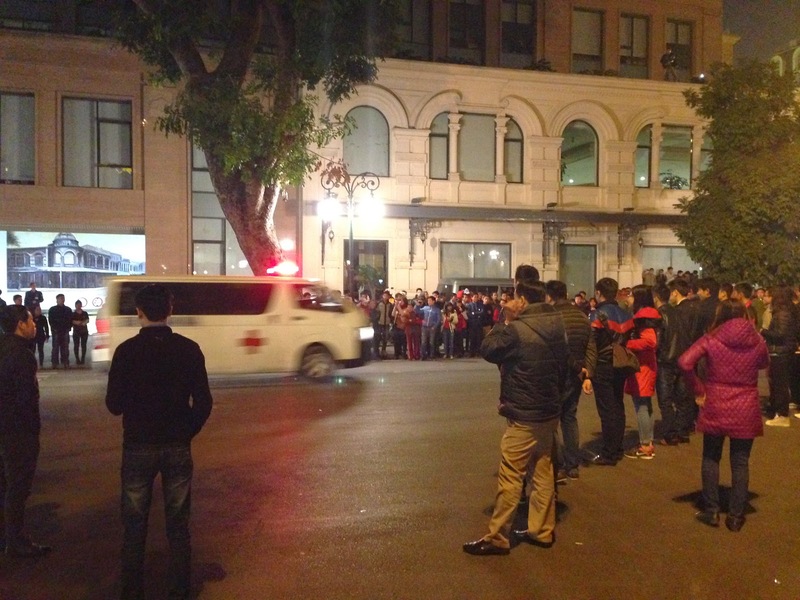 Then paramedics and ambulances started rushing to the scene. Still no alarm of any kind among the crowd. In fact there was still quite a jovial atmosphere. Now firefighters are on the scene, too. What?! 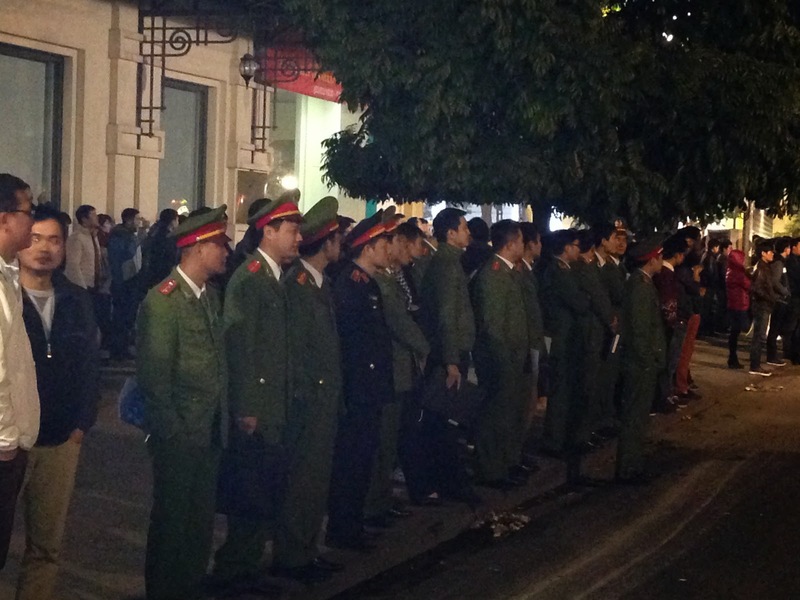 Why were the military still standing there if something so serious was going on? So many questions. Finally, we found a guy with pretty good English, and asked him what was going on. 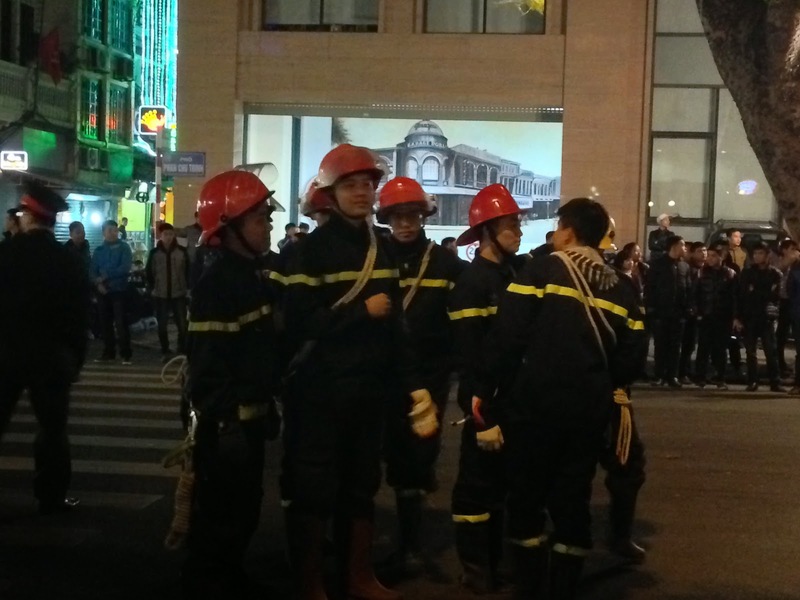 He said that the city was performing an emergency exercise, and it was a routine event. Oh. Okay. A very odd ending to an otherwise great day! 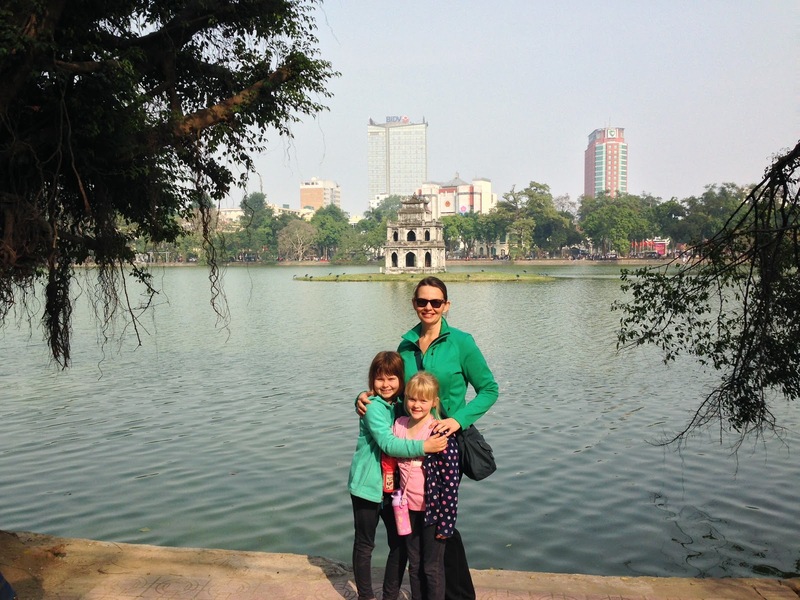 On to our last day in Hanoi tomorrow…. Previous Post HaLong Bay, Vietnam- breathtaking! Next Post Hanoi home cooking class- delicious! What an education for all of you. 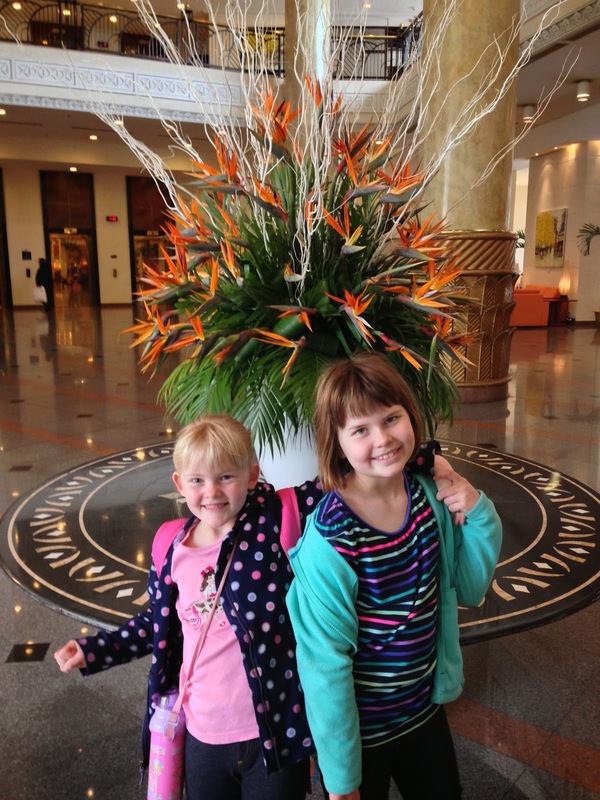 The girls will have a base education head and shoulders above most. What my mom said. Goodness. 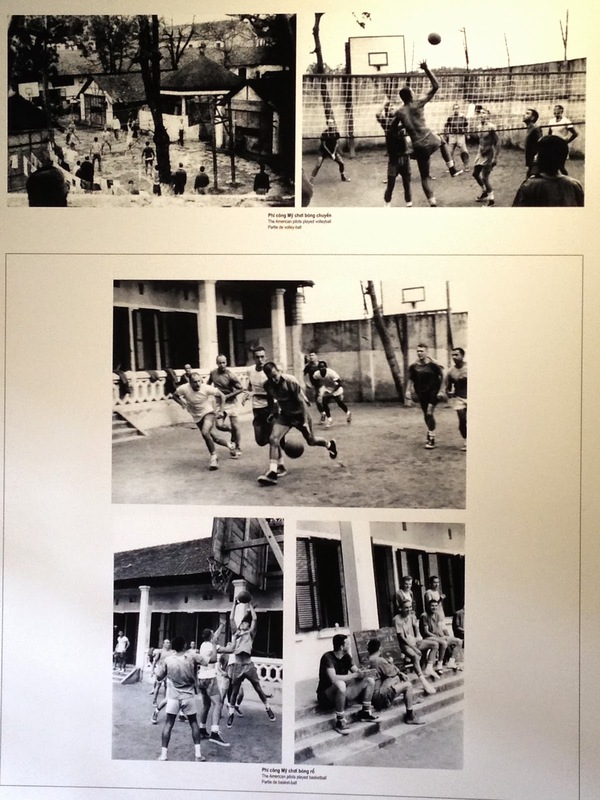 The pictures of the prison were so disturbing, especially when taken with the propaganda pictures. It's hard to think such evil exists in the world. Not that I think the Vietnam war was necessarily a righteous cause on our part. Just….that prison was awful. Love the French influence. 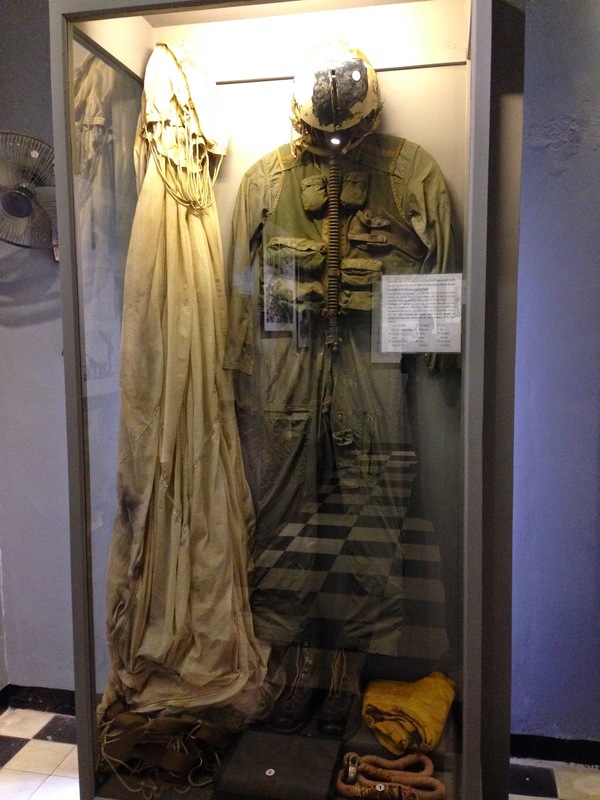 Museums like that are always so sobering and then you leave and the sky is blue, you are free and headed to lunch. Makes you feel guilty. 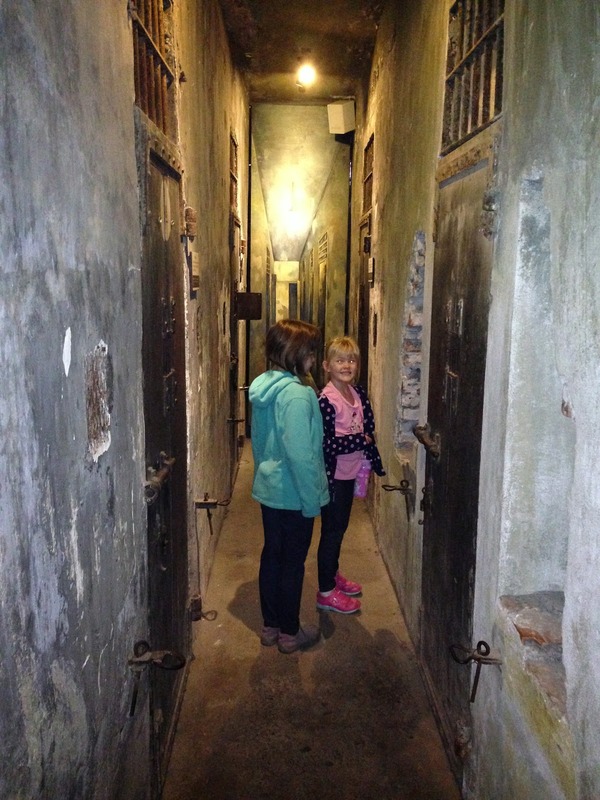 Went to one like it in Budapest: nazi turns communist prison.